The latest summer collection by Artdeco is inspired by the strong colours, geometric patterns and burning sunsets of deepest Africa. Everything about Tribal Sunset is rich, shimmery and bold. Base products include a range of pressed bronzers, shimmer creams and glowing blushers. If you love to rock a deep all-over tan in the summer months, then this collection is for you. 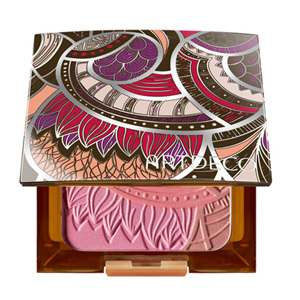 Decadent, ethnic and shimmering like a mirage, the Artdeco Bronzing Glow Blusher is the contouring product of the summer. Three varying shades will accentuate your cheekbones and add depth to your skin tone. Added vitamin C and E ensure your skin remains vitalised and smooth to prevent dryness, flaking and wrinkles. The compact case itself features purple, red, brown and ivory patterns reminiscent of Kenyan art, making it a stunning addition to any make-up bag. It’s not just your face on display during those balmy summer months. If you’re an active woman prone to the odd bump and graze, you’re probably worried about what your pins will look like in that summer dress. Worry no more, because with Artdeco Spray on Leg Foundation you can cover up any bruises, blemishes or discoloured spots with a light, even coloured tan. This comes in three shades: Sand (light), Sun Tan (medium) and Desert Sun (dark). What they lack in imaginative names, they make up for in quality and colour. Mix and match different shades for a truly tribal look. Did you know you can learn make-up tips from a professional? Find out more by visiting our Professional Make-Up page.